The man with the book is coming back. 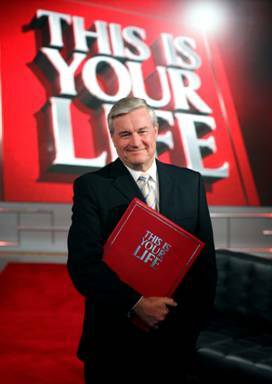 Mike Munro will return to a “new look” special of This is Your Life on 6:30pm Sunday March 9 on Nine. Described as a ‘Red Carpet’ event’ the long-running show that profiles the lives of famous Aussies is back for sixty minutes before 60 Minutes. Other media has speculated that one of the guests in this series is Lleyton Hewitt, after he was spotted leaving Nine’s Sydney Studios. If you’ve attended any audience shoots for This Is Your Life leave your thoughts in TV Tonight’s Studio Audience Spoilers. what happened to this show? it hasn’t been on since the first episode?? btw, is it just me or does Munro look a little like Bill O’reilly in that pic?